Michael Brown, an 18-year-old African American who had recently graduated from high school, was walking with his friend Dorin Johnson through Ferguson, Missouri on Sat. Aug. 9 when they were accosted leading to Brown being gunned down by local police. Several eyewitness accounts of the killing suggesting that Brown had his hands up when he was shot multiple times quickly turned into outrage as hundreds of his fellow community members went into the streets to condemn the brutal attack. Immediately mass demonstrations were organized where people entered the streets with their arms up, in the same fashion as Brown when he was killed, shouting “Don’t Shoot Us.” Brown’s mother, Leslie McSpadden, lamented that she had been overjoyed with her first-born son’s graduation from high school. It is a monumental achievement for African American young people who face countless pitfalls within a racist society which degrades their existence daily. Brown was scheduled to begin classes at a technical college just two days after he was slain by police. People within his age group knew that this could have been anyone of them as well. The step-father of Brown, Louis Head, stood on the street with a sign saying that the police had executed his son. Anger had reached a fever pitch by Sat. evening and the people were refusing to leave the streets. By Sun. other demonstrations were planned including a vigil outside the Ferguson police station. Cops on the scene began to push the crowd back from the streets in fear of the growing mass discontent of the young people. Reports indicate that a section of the demonstration pulled away and began to break windows and trash stores. Police were taken aback and fled from one location to another trying to contain the unrest. Local corporate media outlets immediately began to describe those who were attacking private property as “opportunists and criminals.” They would find people from Ferguson who would urge the youth to refrain from violent actions and to remain peaceful. Yet police operations against youth targeted as “looters and arsonists” were by no means peaceful. Dozens were arrested and plums of teargas spread throughout the affected areas in Ferguson. People were not dissuaded by the media framing of the developments on Sun. Aug. 10. Another demonstration was held on Mon. Aug. 11 where thousands came into the streets. The community was demanding that the policeman who killed Brown be arrested. The officer’s name was supposed to be disclosed on Aug. 12. By nightfall on Aug. 11, police were mobilized for waging war against the African American community. People were being contained through roadblocks set up in areas where demonstrations had taken place over the last three days. Youth in defiance of the police attempted to reassert their democratic rights to assemble and protest against the repressive conditions that lead to the killing of Michael Brown and the atmosphere that has prevailed since then in Ferguson. Law-enforcement agencies from throughout the region have been deployed in the suburb of 21,000 people, most of whom are African Americans. Soon enough as night fell, the police began to fire teargas, beanbags and rubber bullets into residential neighborhoods trying to force people off the streets and into their homes. More arrests took place raising the total to over 50. Police claimed that they were fired on by unknown assailants. These reports could not be fully documented but it served to further raise tensions among law-enforcement officers dressed in military gear patrolling Ferguson in armored vehicles. On Aug. 12 the much-anticipated announcement of the name of the officer involved in the shooting death of Michael Brown was not revealed. Police claim the name was not made public because of fears for his safety. Nonetheless, the safety of Brown and thousands of other African Americans in Ferguson was not considered on Aug. 9, the day of his killing; or since then with the massive occupation of the community by law-enforcement. Anticipating continuing anger and mass demonstrations, the authorities in Ferguson declared a so-called “no-fly zone” over the suburb on Aug. 12. In a statement issued by the Ferguson police it says “On Sunday night our police helicopter came under fire on 3 or 4 occasions, so we requested that the FAA put up a no-fly zone for the safety of pilots who would be in the area,” St. Louis County Police Department Officer Brian Schellman said. This “no-fly zone” will be in effect until Monday, Aug. 18. Although no helicopters or police vehicles were reportedly hit, Schellman said that “We don’t know if it was a long gun or a handgun or what. Many suspected that the live news coverage of the rebellion in Ferguson had proved troublesome for the local authorities where press helicopters have provided aerial views of the unrest. Interestingly enough, it appears as if the commercial air traffic in and out of St. Louis will not be impacted by the “no-fly zone.” The police sought to deny that these measures were designed to curtail the world spotlight now on Missouri and the racist violence perpetuated by law-enforcement in the U.S. against the African American and other nationally oppressed communities. 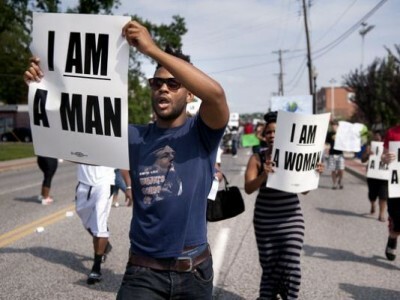 The police killing of Michael Brown is by no means an isolated incident. These shootings take place almost on a daily basis at the hands of the police and racists outside the organized armed wing of the racist state in the U.S.
Marlene Pinnock in Los Angeles County was nearly killed by a California Highway Patrolman on July 1 when she was held down and beaten repeatedly in the face and head. If this blatant violation of civil and human rights had not been caught on videotape it may have gone unnoticed by the world. What distinguishes the killing of Brown in Ferguson is that the community rose up immediately in righteous indignation. Whether non-violent or violent, the African American people were justified in striking back against the oppression they face on a daily basis. U.S. society is built on the oppression of people of color communities and the level of state-sanctioned violence is escalating. President Barack Obama, although of African descent, does nothing to address the special oppression of the African American people. Despite the massive unemployment, underemployment, incarceration rates and law-enforcement repression facing African Americans, these issues are never addressed by the White House, the Congress or the corporations which dictate government policy. Attacks on private property during anti-racist rebellions represent the alienation of the nationally oppressed from the dominant economic interests that control the U.S. and the world. Even though the White House and Wall Street will only respond to an African American rebellion with benign neglect and further state repression, it does not hesitate on a foreign policy level to engage in more wars against people throughout the world. Several days prior to the brutal killing of Michael Brown, Obama authorized and carried out aerial bombardments in northern Iraq under the guise of protecting civilians and religious minorities. Of course most people in the U.S. opposed the Iraq war which Obama promised to end when he ran for office in 2008. Nevertheless, he has re-entered the Iraqi theater again adding to the administration’s wars against Afghanistan, Libya, Yemen, Palestine, Sudan, Syria, Somalia and others. Whether it is the people of Africa, Central Asia, Latin America and the Middle East or those of the oppressed communities of Los Angeles, New York or St. Louis, their lives become worthless in the face of the imperatives of the powerbrokers of Washington and Wall Street. However, these peoples will inevitably respond through rebellion and other forms of resistance against a militarily and economically powerful enemy which acts not out of principle but based upon the continuing mad drive for profits and military supremacy over the vast majority of humanity.